After the terrible tsunami that occurred in 2011, S.T. Dupont dedicated Hope Limited Edition to Japan, as a symbol of love and optimism for this beautiful country. 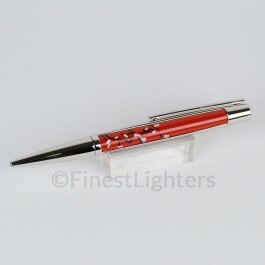 This is the Hope Defi ballpoint pen, finished in bright red and decorated with sakura blossoms, the flower of the cherry tree which symbolizes renewal and good fortune. For more information about "Hope" Limited Edition click here.